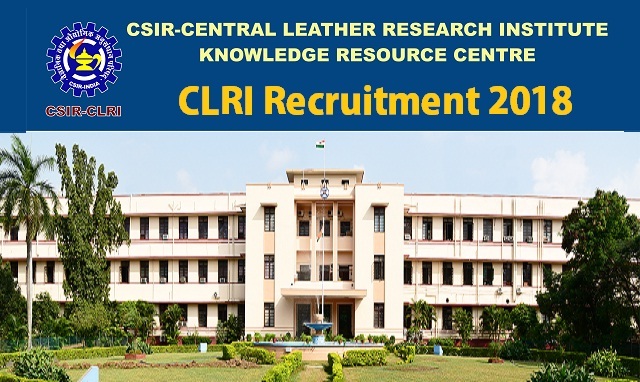 CLRI-Central Leather Research Institute Recruitment 2018 2019 Application Form for 03 Project Assistant Posts Download Application through Official website www.clri.org. CLRI Project Assistant Jobs Notification 2018 Released. The Interested and Eligible Candidates are requested to Download Application through Official website. CLRI Project Assistant Recruitment 2018 Walk-in @ Chennai - Apply Now. CLRI Project Assistant Recruitment 2018 Walk-in @ Chennai - Apply Now. Candidates fulfilling the above mentioned qualification, age etc., may attend the Walk-in Interview scheduled on Wednesday, the 11th April 2018 at BM Das Hall, CLRI at 09.00 AM onwards along withapplication form available in website (www.clri.org) duly filled with Xerox copies/ photocopies of necessary certificates along with original certificates for verification and 2 passport size colour photographs.